The public, including a member of the Maryland Drivers Alliance, was banned from attending a speed camera symposium in Bowie Maryland today. The event, which we had discussed in a previous posting, was sponsored by The Maryland Association of Counties(MaCo) and the Maryland Municipal League (MML), both of which are funded in large part by taxpayer dollars. The heads of the speed camera programs for Montgomery and Prince George's County, Captain Tom Didone and Major Liberati, were leading the event. AAA (an insurance company which helped to give Maryland speed cameras in the first place) also co-sponsored the event. The Maryland Drivers Alliance had been specifically invited to attend the symposium by John Townsend of AAA. However when a Maryland Drivers Alliance member, Gene Simmers, attempted to sign up for the symposium Captain Tom Didone informed him that he would not be permitted to enter. "Capt. Didone called me back and informed me that I was denied permission to attend tomorrow's meeting in Bowie." wrote Simmers "He mentioned that he especially didn't want anyone from our group to attend since Ron is so anti-speed camera. I asked him who would be attending and he said county employees. I then asked him if he was aware of the Maryland Openings Act and he said no." We complained to Townsend of AAA, as we had been previously advised that we could attend. "Gene, at Ron’s request," [referring to the MDA chairman] "and on your behalf, we had asked for you and members of the alliance to be able to attend." wrote Townsend. "I have [asked] the major sponsors to reconsider their position. I think they should" wrote Townsend. He then advised Mr Simmers to "Make your appeal in person." The next day Mr Simmers appeared at the Symposium in Bowie as AAA had suggested... and was barred from entering by police and by Captain Tom Didone. "I showed up at 9:10 am and introduced myself at the check in desk. As I was speaking, a Mont. County police officer pushed his way through the crowd and proclaimed " I will handle this". A few minutes went by and Captian Didione showed up. He began to repeat that he had told me no yesterday . I showed him the e-mail from Townsend and that was the only reason I drove from Harford County to attend. He then started to become a little rough and said he had told me 3 times the reasons why I could not not attend. I told him I didn't like any of his 3 answers. He repeated that the reason that I could not attend was because of pending legal action between our group and a community at the symposium. I told him that" anyone who has watched a repeat of any Law and Order show would know that pending legal would never be discussed by police officers at a public meeting. Townsend showed up and literally froze when I asked for his opinion. Regina Averella of AAA was standing next to me and said" I don't get in the middle with this". Capt Didone also said my presence in the room would be intimidating to some in attendance. I told him that I didn't know anyone in the room and no one would know who I was, he just looked down and left for impromptu meetings. At least 5 members of AAA and 3 police officers were gathered around me. When the symposium started the police officer who pushed his way to the table remained outside in the hallway at the table. He stayed at the table the ENTIRE time from 9:15 until 12:00 when lunch started . He was joined by another officer as well. This guy never attended one minute of the symposium . I sincerely doubt if his task was to guard a registration desk that collected no money all day. I had a babysitter I believe." Media presence at the symposium was also severely restricted. One reporter from a local radio station was permitted to attend a portion of the symposium, because he had been invited to provide a presentation to speed camera programs about "How to Conduct an Effective Media Campaign". However even that reporter was forced to leave at 1:00 as soon as his presentation was over. 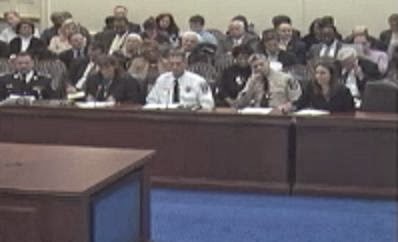 MaCo and the various speed camera programs of the state had an opportunity to demonstrate that they were transparent and that they were open to hearing input and criticism from the driving public. Instead what they decided to prove was that they prefer to skulk around in dark corners and concoct secret legislative schemes in private meetings, all funded by taxpayer dollars. They have proven that speed camera programs are basically just like vampires.... unable to survive in the light of day.